List Rules Vote for your favorite Atomic Blonde movie quotes! Atomic Blonde movie quotes bring the thrills to the film about a MI6 operative sent undercover to investigate double agents during the Cold War. The action spy thriller was directed by David Leitch using a screenplay Kurt Johnstad adapted from the graphic novel The Coldest City by Antony Johnston and Sam Hart. Atomic Blonde hit theaters in the United States on July 28, 2017. In Atomic Blonde, it's 1989 and Lorraine Broughton (Charlize Theron) is an experienced MI6 spy who is brought in by MI6 executive Eric Gray (Toby Jones) and CIA Agent Emmett Kurzfeld (John Goodman). Lorraine is asked about the murder of MI6 agent James Gasciogne, who, before his death stole information on double agents in the Soviet Union. She's also tasked with finding out who killed James and recovering the list of double agents. 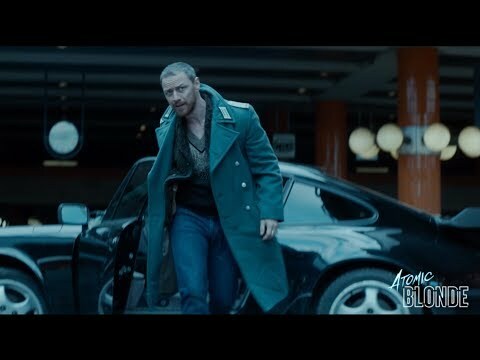 So Lorraine sets out on her mission, including with the help of her operative David Percival (James McAvoy). But it doesn't take long for Lorraine and David to turn on one another as both seek the list for their own gain. So not only does Lorraine have to fight off all the Soviets trying to get the list, but also a former ally as well. Atomic Blonde was one of several great summer 2017 films along with Girls Trip, 47 Meters Down, All Eyez on Me, and Rough Night. Lorraine Broughton: I chose this life and someday it’s going to get me killed, but not today. Lorraine explains a bit about herself and the film in this Atomic Blonde movie quote. As she mentions, she selected the life of an undercover MI6 agent with a full understanding of the danger that line of work brings. David Percival: Welcome to Berlin. I’m David... Don’t shoot. I’ve got your shoe. Lorraine Broughton: I was made from the moment my feet touched the ground. David Percival: This was never part of the plan. Lorraine Broughton: It was part of mine. Lorraine's contact David tries hard to introduce himself to her in these Atomic Blonde movie quotes but she's not really interested. She realizes that she's under threat but seems to have things under control. Emmett Kurzfeld: Lorraine, there’s a double agent hunting our operatives in Berlin. Your mission, find out who did this. Remember, trust no one. Your contact is David Percival. CIA Agent Kurzfeld explains more about Lorraine's mission in this Atomic Blonde movie quote. Lorraine is to trust no one, well, except for her contact, David. Emmett Kurzfeld: The clock is ticking and everyone you get close to ends up dead. Lorraine Broughton: Someone’s set me up, someone from the inside. Now this only ends one way, a bullet. Emmett stresses the importance and timelines of what Lorraine must do. She understands the threat very well and exactly what needs to happen to finish things once and for all.